It is a general purpose chassis mounting mains transformer. Transformer has 240 V primary windings and centre tapped secondary winding. The transformer has flying colored insulated connecting leads ( Approx 100 mm long ). The Transformer act as step down transformer reducing AC - 240V to AC - 9V. The Transformer gives two outputs of 9V, 9V and 0V. The Transformer's construction is written below with details of Solid Core and Winding. 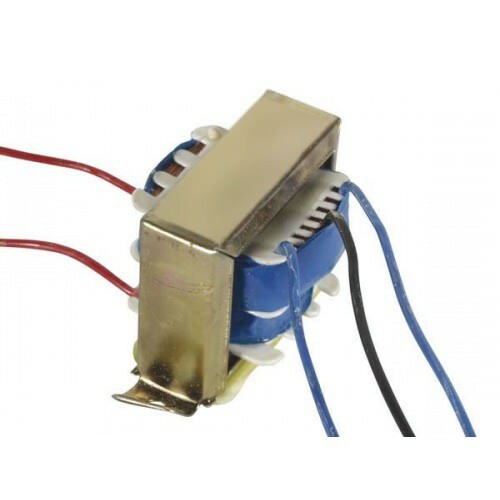 Also Searched as : 9 0 9 Transformer 750mA, 9 0 9 volt transformer, step down transformer 9v 750ma, 9v 750ma transformer, 9 0 9v 750ma transformer online india, buy 9v 750ma transformer, 9 0 9v 750ma transformer buy online india.